..... Click the link for more information. . He is also called the Tathagata [he who has come thus], Bhagavat [the Lord], and Sugata [well-gone]. He probably lived from 563 to 483 B.C. The story of his life is overlaid with legend, the earliest written accounts dating 200 years after his death (see Buddhist literatureBuddhist literature. During his lifetime the Buddha taught not in Vedic Sanskrit, which had become unintelligible to the people, but in his own NE Indian dialect; he also encouraged his monks to propagate his teachings in the vernacular. His given name was Siddhartha and his family name Gautama (or Gotama). He was born the son of a king of the Sakya clan of the Kshatriya, or warrior, caste (hence his later epithet Sakyamuni, "the sage of the Sakyas") in the Himalayan foothills in what is now S Nepal. It was predicted at his birth that he would become either a world ruler or a world teacher; therefore his father, King Suddhodana, who wished Siddhartha to succeed him as ruler, took great pains to shelter him from all misery and anything that might influence him toward the religious life. Siddhartha spent his youth in great luxury, married, and fathered a son. The scriptures relate that at the age of 29, wishing to see more of the world, he left the palace grounds in his chariot. He saw on successive excursions an old man, a sick man, a corpse, and a mendicant monk. From the first three of these sights he learned the inescapability of suffering and death, and in the serenity of the monk he saw his destiny. Forsaking his wife, Yashodhara, and his son, Rahula, he secretly left the palace and became a wandering ascetic. Siddhartha first studied yogic meditation under the teachers Alara Kalama and Udraka Ramaputra, and after mastering their techniques, decided that these did not lead to the highest realization. He then undertook fasting and extreme austerities, but after six years gave these up fearing that they might cause his death before he attained illumination. Taking moderate food, he seated himself under a pipal tree at Bodh Gaya and swore not to stir until he had attained the supreme enlightenment. On the night of the full moon, after overcoming the attacks and temptations of Mara, "the evil one," he reached enlightenment, becoming a Buddha at the age of 35. Leaving what was now the Bodhi Tree, or Tree of Enlightenment, he proceeded to the Deer Park at Sarnath, N of Benares (Varanasi), where he preached his first sermon to five ascetics who had been with him when he practiced austerities. They became his first disciples. The first sermon, known as "the setting into motion of the wheel of the dharma," contained the basic doctrines of the "four noble truths" and the "eightfold path." For the remainder of his life he traveled and taught in the Gangetic plain, instructing disciples and giving his teaching to all who came to him, regardless of caste or religion. He spent much of his time in monasteries donated to the sangha, or community of monks, by wealthy lay devotees. Tradition says that he died at the age of 80. He appointed no successor but on his deathbed told his disciples to maintain the sangha and achieve their own liberation by relying on his teaching. He was cremated and his relics divided among eight groups, who deposited them in shrines called stupas. See E. J. Thomas, The Life of Buddha as Legend and History (3d ed. 1952, repr. 1960); A. C. A. Foucher, The Life of the Buddha (1963, repr. 1972); D. J. and I. Kalupahana, The Way of Disshartha (1987). Bronze sculpture of Buddha in Batsford Park, Gloucestershire, England. Fortean Picture Library. Siddhartha was born around 563 BCE to the Sakya clan in Lumbini, located near the Nepal/India border. A Brahmin priest visited the family compound and prophesied that the young prince would grow up to be either an emperor or a Buddha, an Enlightened One. The child's father wanted the boy to grow up to be an emperor, so he sequestered young Siddhartha within the walls of the palace, hoping to discourage any untoward spiritual development by supplying everything the young man desired in the way of material delights. But young men are curious, so one day Siddhartha had his chariot driver take him out into the real world. There he saw four sights that changed the course of his life and of history. The first thing he saw was an old man. From this he learned that every life will come to an end. The second thing he saw was a man suffering from a hideous disease. From this he discovered that all life is suffering. Next, he caught his first glimpse of a corpse. He learned that death is real. I also am subject to death and decay and am not free from the power of old age, sickness and death. Is it right that I should feel horror, repulsion and disgust when I see another in such plight? And when I reflected thus... all the joy of life which there is in life died within me. What the story illustrates so far is a phenomenon known as the "frog in the kettle" syndrome. The syndrome takes its title from the supposed fact that if a frog is thrown into boiling water, its reaction to the sudden change of temperature is so great that it will immediately hop out to avoid being scalded. But if the same frog is placed in water at a temperature to which its body is accustomed, and if the water is gradually heated, the change will seem so slight that the frog will not notice its predicament until it is too late. Most people, as they grow up, gradually become accustomed to the realities of life—great joys as well as great suffering—and they accept, as a matter of course, that this is the nature of what it means to be human. But Siddhartha, unaccustomed to suffering while growing up, became the frog that was thrown into the boiling water. It affected him drastically and changed his life. He spent the remainder of his life learning how to hop out of the kettle of suffering he had so suddenly been exposed to. While contemplating all he had seen, still not understanding, he saw the fourth sight that would alter him so dramatically: he gazed upon a holy man who seemed quite content. Siddhartha decided he had to study the meaning of life by becoming a holy man. Siddhartha's father, by trying to keep him from seeking a spiritual path of wisdom, had instead catapulted the young man toward exactly that destiny. At this point the story becomes legend and the details vary. Some versions have Siddhartha simply leaving home to begin his journey. Others provide more detail. A popular rendition, consistent with Siddhartha's personality in view of later events, tells how the young man went home to confront his family. When his father refused to let the boy leave, Siddhartha simply waited, saying he would not move until he had his father's consent. Dinnertime came and went. Siddhartha remained patiently in place. Bedtime came, and his father was sure that by morning the boy would return to his senses. But morning's light found the boy standing still, ready to have his way or die. Needless to say, the young prince eventually got his way. Saying goodbye to his family (some versions include a young wife), Siddhartha, with his faithful charioteer, left the family compound and began a search for the meaning of life. For six years he wandered and studied. He talked with Brahmins, Hindu holy men. He learned yoga disciplines and meditation. He practiced extreme asceticism, eventually cutting down to one grain of rice a day and deciding that since he could exist on one grain, why not try slicing it in half to make it last twice as long? It is said he became so thin and emaciated that a person could grasp Siddhartha's backbone from the front. Even after all this, enlightenment eluded him. By this time he had joined a group of traveling holy men, none of whom was making any more progress along the spiritual path than he was. Terribly discouraged, he resorted to what had worked with his father. Seating himself beneath the famous Bo tree (Bodhi-tree—"Tree of Knowledge"; some legends make it a fig tree) he vowed he would meditate there, not moving until he reached enlightenment or died. There he passed through the four Hindu stages of consciousness. When thus prepared, Mara, an old Hindu god and devil figure, lured him with three temptations. First came the temptation of the flesh. Three beautiful women walked by, begging him to follow. Next came the temptation of the spirit. Ferocious demons attempted to frighten him enough to make him flee from his place beneath the Bo tree. Smiling, Siddhartha simply touched the earth upon which he sat, saying, in effect, "I have a right to be here and here I will stay!" When these temptations proved inadequate, the devil switched to the subtle temptation of pride. Whispering in Siddhartha's ear, Mara congratulated him on his spiritual growth, telling him that his insights and dedication were too profound for normal people to understand and that it would be profitless to attempt to teach them to others. With this final spiritual victory, he passed through all stages of awareness. He saw in a flash all his previous incarnations and understood their connectedness, how they had brought him to this point in time and place. Now he understood Karma at work. He sensed the guiding force that propels life forward. And, more important, in a sudden intuitive leap, he grasped how to break out of samsara, the wheel of life, death, and rebirth. He had achieved the goal of his quest. He had become the Buddha, the Enlightened One. He called his insight the dharma, the Middle Way that leads between the poles of all opposites to Nirvana, the place beyond, which embraces all extremes. The Buddha saw life in terms of duality, pairs of opposites. For every up, there is a down; for every left, a right. There cannot exist cold without heat, joy without sorrow. So one-half of every pair of opposites is uncomfortable. The natural human tendency is to identify with what is good, comfortable, or otherwise desirable. Buddha saw this was impossible. Unless both poles of opposites are embraced, one cannot be content, because both poles are real and make up the fabric of life. To remain insulated from one pole or the other is to live in denial. Eventually, even if we live in a palace, we must journey outside the walls and experience the reality that is life in all its totality. Denying or even ignoring death and sickness doesn't make them less real. All it does is produce anxiety because the human psyche knows they are inevitable. Siddhartha condensed his insight into what he called the Four Noble Truths (see Buddhism). He taught these principles to the men with whom he had previously traveled. At first, when they saw him eating whole meals, they thought he had departed from the spiritual path. But, upon hearing his first sermon, the Deer Park Discourse, they realized he had attained his quest and become the Buddha. They became his disciples, and from this group of monks grew the religion we know today as Buddhism. An organization developed. Buddhism became the first great missionary religion, eventually spreading throughout the entire world. One of the Buddha's disciples, Devadatta, tried to betray and kill him but was thwarted in his attempt. The Buddha lived for another forty-five years, teaching and delivering discourses, now called Sutras. 1. Be ye lamps unto yourselves. 2. All compounds [aggregates, even people] are transitory. 3. Work out your own salvation with diligence. With that, he breathed his last, departed samsara, and entered Nirvana, beyond all pairs of opposites, even the opposites of life and death. From this place of cosmic consciousness, existing always beyond time and place, the spirit of the Buddha is engaged in drawing the Buddha nature, inherent in every person, to himself. While Buddhism stands alone, irrespective of comparisons with other traditions, any reader familiar with the story of Jesus Christ, founder of Christianity, will have noticed the parallels between the legend of the life of the Buddha and the legend of Jesus Christ. Both left their homes seeking the truth that exists beyond average human existence. Both were led into the wilderness, where they were tested by the devil with three temptations. Both gathered a group of disciples, one of whom became a betrayer. Both returned from their wilderness experience to preach a sermon summing up their teaching: Buddha delivered the Deer Park Discourse, Jesus preached the Sermon on the Mount. Such comparisons do not suggest that one religion is an imitation or copy of the other. It is obvious that the two rose independently of each other and stand as separate entities. There are many points of contrast between the two, especially in their teachings concerning the nature of God (many Buddhists do not believe in a personal deity), time (linear versus circular), and afterlife (heaven versus Nirvana). But similarities also exist, pointing to a common human experience. Perhaps these similarities were best summed up in Questions of Faith II: Who Is Jesus? by Roy Sano, who was born into a Buddhist family but became a Methodist bishop: "When I converted to Christianity I wondered how I could still be a Buddhist. As time goes by I now wonder how I can be a Christian and not be a Buddhist!" (in Sanskrit, literally “the Enlightened One”), according to the Buddhist religion, a being who has attained highest sanctity. There is a plurality of Buddhas in the Buddhist pantheon. In a narrower sense, “Buddha” is a name for Siddhartha Gautama, who, according to Buddhist tradition, was the founder of Buddhism and lived from 623 to 544 B.C. or 60 years later. According to Buddhist tradition, he came from a royal family of the clan of Gotama—hence his family name Gautama—of the Shakya tribe, which lived in northern India at the southern border of present-day Nepal. From this tribe one of his cognomens—Sakyamuni, Hermit of the Shakyas—is derived. At the age of 29, Buddha left his family and home and, after seven years of wandering, asceticism, and meditation, became the preacher of a new doctrine. What does it mean when you dream about Buddha? 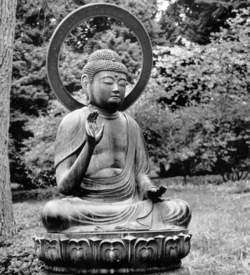 In Western culture Buddha is thought of as a benevolent sage. Unless the dreamer has other, more specific associations, a dream about a Buddha may be a sign that the dreamer desires the blessings of wisdom, insight, or compassion. And two years ago three French tourists were given suspended prison sentences for kissing a Buddha statue. Last year, a Brit was denied entry to Colombo because he spoke "disrespectfully" when asked about a Buddha tattoo on his arm. We celebrated the historical importance of Buddha statues. Three years ago noted Indian-American journalist Fareed Zakaria raised a storm by mentioning in his book 'The Post American World' that Buddha was born in India. Who is this scientific Buddha who, in Lopez's view, is threatening, "bleaching," "domesticating" the message of the original Buddha? Icon Shoes, a California-based company established in 1999, had earlier this year uploaded pictures of shoes bearing Buddha images on its website for promotion, immediately drawing condemnation from Buddhist groups in Nepal and around the world. The Buddha laid stress on this fact and left no room for anyone to fall into the error of thinking that He was an immortal being. In accordance with French Mission Report that "we must keep in mind that historical heritage of Bamyan's standing Buddha had not been built in months, years or a century but centuries of constant efforts of thousands scriptures and other skilled-men helped chopping the two giant standing statues". Buddha Monk is celebrating his birthday in Worcester, which might come as a surprise to people who know him as a celebrated rap artist from Brooklyn, N.
Many top ranked South Korean army members including Defense Minister Han Min-gu attended the birth day celebration of Buddha. has appointed San Diego-based Sabemos Beverages LLC as importer of record for the Lucky Buddha beer brand. The research aims to show how practices have been adapted to the non-Japanese environment of the American services to make the Teaching of the Buddha more accessible, understandable and practical to the service's attendees.